One of the highest cable cars in the world, apart from a few in South America. 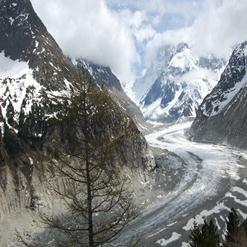 In fact the Aiguille Du Midi starts at 1035 m and finishes at a staggering 3810m! From the bottom to the top, it has the greatest vertical range in the world. Bring warm clothes as the temperature is always cold even in mid-summer. Don't miss the exhilarating 5 Km cable car ride over snow capped mountains from Aiguille du Midi on France to Helbronner on Italy.